Panthers number one Scott Nicholls. 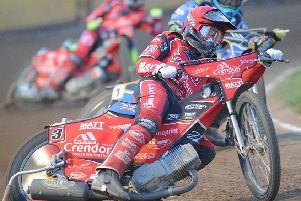 Pace-setting Peterborough Panthers entertain closest rivals Lakeside Hammers in a mouth-watering clash at the East of England Arena (7.30pm). The meeting was under threat at one stage yesterday due to electrical problems, but that has been swiftly rectified - much to the delight of Panthers owner Ged Rathbone. He said: “There was an electrical issue yesterday but thankfully the team at the East of England Arena got it sorted very quickly. “It’s the biggest night of the GB Championship season so far and it’s brilliant to be involved in a big top-of-the-table clash. “It looks like we’re going to be blessed with fantastic weather - and I’m sure the two best teams in the league at this current moment will serve up a fantastic meeting as well. Both teams are set to be at full-strength for the top-of-the-table showdown. Danish ace Ulrich Ostergaard has recovered from whiplash and concussion to slot back into the city side while the Hammers have Kyle Newman available again after a collar-bone problem. Panthers go into battle a point clear of Lakeside at the summit, but the visitors boast two meetings in hand.